Are you aware that motor vehicle crashes are the leading cause of deaths among those who are 16 to 19 years old? It's true. To combat alarming statistics such as this, many states – including Connecticut – have focused on safety by implementing a Graduated Driver Licensing (GDL) program. One of the first steps towards obtaining your Connecticut driver's license is to get your learner's permit. Below you will find everything you need to know, from where you need to go, to what you need to bring. (860) 263-5700 if you're in the Hartford area or outside of CT.
(800) 842-8222 if you're elsewhere in CT. Unfortunately, learner's permits from other states cannot be transferred to Connecticut. If you are new to CT, you will have to obtain a Connecticut learner's permit, even if you already have one from your previous state. It's important to note before getting your CT driver's license, you must hold a learner's permit for 120 days if you took your Driver's Ed course from a Connecticut licensed commercial driving school or secondary/high school, and 180 days if you did home training for Driver's Ed. In addition, you must also supply the required documents and meet the other GDL requirements mentioned below. You must be at least 16 years old to get a learner's permit. Connecticut has two sets of rules for obtaining a learner's permit: one set of rules for teens ages 16 years old and 17 years old, and one for teen adults 18 years old and older. NOTE: If you're new to the U.S. and have an I-94 stamp in your passport, you must visit the U.S. Customs and Border Protection website to obtain a hard copy of your I-94 document in order to apply. A completed Application for Non-Commercial Learner Permit and/or Driver License (form R-229). 2 documents proving identity (U.S. birth certificate, U.S. passport or passport card). 2 documents proving Connecticut residency (bank statement, pre-printed pay stub, postmarked mail). 1 document proving Social Security number (Social Security card, W-2 form or 1099 form issued within the last 5 years). Proof of legal presence in the U.S., if you were born outside of the country (I-94 and U.S. Visa, I-551 stamp in a foreign passport, resident alien card). A completed and notarized Certificate of Parental Consent (form 2D). Required only if your parent, legal guardian or spouse who is over 18 years old, did not accompany you to the DMV. Up to $8 processing fee (if applicable). For more information about these required documents, please refer to this list of acceptable forms of identification. If you're 18 years old or older, you must get an adult learner's permit and hold it for 90 days before you can take the on-the-road skills test. Active duty military stationed out-of-state (must show military orders and ID card). Teens that have held a learner's permit for over 90 days. Any person that has held a driver's license in the past (must provide expired license or abstract from previous state or county). A completed Application for A Non-Commercial Learner Permit and/or Driver License (form R-229). 2 documents of identity (U.S. birth certificate, U.S. passport or passport card). 2 documents of Connecticut residency (e.g. bank statement, pre-printed pay stub, postmarked mail). 1 document of Social Security number (Social Security card, W-2 form or 1099 form issued within the last 5 years). Once you have the required documents mentioned above, it's time to make an appointment to take your knowledge test. Appointments are offered at: Bridgeport, Cheshire, Danbury, Hamden, Norwalk, Old Saybrook, Waterbury, Wethersfield, and Willimantic offices. 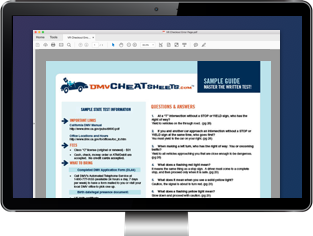 The Connecticut permit test consists of 25 questions about road signs and road rules taken from the Connecticut Driver's Manual. You'll need to answer 20 questions correctly to pass. Pay a $40 permit test fee. Pay an additional $19 learner's permit fee. Depending on your municipality, you may also pay a processing fee of up to $8. The Connecticut DMV offers an app to help you prepare for the written exam. In addition, we recommend using an online practice test from our approved partner. Your success is virtually guaranteed! NOTE: The permit testing fee and learner's permit fee must be paid separately in the branch office, or you can do it online. As part of the GDL process you must complete an approved driver's education course AFTER obtaining a learner's permit, and BEFORE getting a driver's license. 30 hours of classroom training (includes the Safe Driving Practices course). 2 hour parent/guardian training (included in the course). Must hold your learner's permit for 120 days before taking road test. 30 hours of classroom training (includes Safe Driving Practices course). 2 hour parent/guardian training (included in course). 22 hours of classroom-type training. An 8-hour Safe Driving Practices course. Must be taken separately at a commercial driving school or high school. 2 hour parent/guardian training (included in Safe Driving Practices course). Must hold your learner's permit for 180 days before taking road test. As noted above, both the commercial driving school and secondary/high school curriculum include the Safe Driving Practices course and the 2 hour parent/guardian training. The at-home training will require you to seek out the Safe Driving Practices course separately. Upon successful completion of Driver's Ed, you'll receive a Driver Education Certificate (Form CS-1). This certificate is proof that you completed the course, and will be required before you can take the road skills test. For more information about CT driver's education, please refer to our Driver's Ed in Connecticut page. In addition to the Driver's Ed requirements mentioned above, all teens must also complete 40 hours of behind-the-wheel driver training. Like Driver's Ed, this training can be completed at a commercial driving school, your secondary school/high school, or at home with a qualified driver trainer. Be a parent, foster parent, legal guardian, grandparent, or spouse. Be at least 20 years old and have held a Connecticut license for a minimum of 4 years consecutively without suspension. Provide a signed statement that you completed at least 40 hours of behind-the-wheel training. You are not allowed to have any passengers except for your qualified driver trainer and your parent(s) or legal guardian(s). All passengers in the vehicle must wear seat belts. You may not use cell phones or other electronic devices while driving. An acceptable form of identification (U.S. birth certificate, U.S. passport or passport card). Payment for the $19 fee (an additional processing fee of $8 if applicable). For more information, please refer to our page on replacing a lost license/permit. Once you have your Connecticut learner's permit in hand, you're ready to continue your quest to get your driver's license. It's important that you continue to follow safe driving practices throughout your entire journey. The next step in the GDL process is to get your driver's license. For more information, please visit our Teen Driver's License page. The Department of Motor Vehicles' application for a non-commercial Connecticut learner's permit OR driver's license. The parent or legal guardian of a minor must complete this form to give the minor permission to apply for a CT learner's permit, driver's license, OR vehicle registration. Form must be notarized.